Doctor Who Series 10 is upon us and if you’re interested in being the first to watch it anywhere in the world then follow my simple guide below. If you’re as excited for Series 10 as I am and The Return of Doctor Mysterio special got your mouth watering then you’ll be happy to know you can watch Series 10 online anywhere in the world at the same time as the UK. To watch Doctor Who Series 10 at the first possible opportunity you can stream it live on BBC iPlayer. If you’re outside the UK then you’re going to need to sign up for a VPN service otherwise you’ll be blocked. A VPN allows you to alter your online location and bypass any geographical blocks. A VPN service will cost you between £4 – £7 per month depending on how long you sign up for. We’ve tested a range of services and found the following three to be the best. All you need to do is click on one of their names and sign-up. To watch Doctor Who follow the instructions below, we’ve used IPVanish on a PC as an example. Download the Windows software from the Apps area of the IPVanish website. Run the installed IPVanish software. It takes around 15 – 30 seconds for the IPVanish software to connect. Once it has connected you will get a notification. That’s all there is to it, all you need to do now is visit the BBC iPlayer website at the time Doctor Who Series 10 is being shown and you’ll be able to watch live. If you miss the live showing then you can also watch on catch-up after. Below is an example video to show you just how easy it is. The new Series 10 starts on Saturday, 15th April 2017. The series will run for 12 episodes to be shown on each consecutive Saturday after the first episode. There is currently no confirmed time for the episodes to be shown but it is expected to be shown between 6:30 pm – 8:00 pm UK time. Peter Capaldi is back as the Doctor in Series 10 but it’s expected to be his last after three series in charge as the Doctor. New side-kick Bill Potts will be played by Pearl Mackie and will travel with the Doctor throughout most of Series 10. Fans of Matt Lucas will be happy as Nardole is expected to make a return and feature through much of Series 10. Behind the scenes, Steven Moffat and Brian Minchin take charge for the final time after spending the entire three series overseeing the programme while Peter Capaldi has been at the helm. On the 13th March 2017, the latest full trailer for the series was released. There has been very little information leaking out about the new Series 10 which has left many guessing. The latest trailer has started speculation across the internet and these are some of the conclusions. In the latest artwork released with the trailer, a large red planet was spotted suggesting Doctor Who could be travelling to Mars. If this is correct The Ice Warriors could be making an appearance. Although with users suggesting it could be Gallifrey, judgement is still out. Time travel to Victorian England could be on the cards and a frozen river Themes with a giant serpent rearing it’s head if speculation is correct. A fire engulfed city is shown but commentators noted that it doesn’t look like a city on earth so perhaps a large fire may take place on one of the far off planets. Finally what viewers think is Earth is depicted on the image but those in the Doctor Who know suggest it could depict Mondas and if those thoughts are true we could see new Cybermen about. What about watching on a mobile or tablet? It’s possible to watch on a mobile phone or tablet but you will already need to have the BBC iPlayer app installed on your device – it’s not possible to do this easily outside the UK. If you do already have it installed then you can download the Android or iOS app for the VPN provider you signed up to from the Google Play Store or the Apple Store. Then connect to the United Kingdom and then launch the BBC iPlayer app. Occasionally some VPN servers do not work with BBC iPlayer or the BBC iPlayer app. 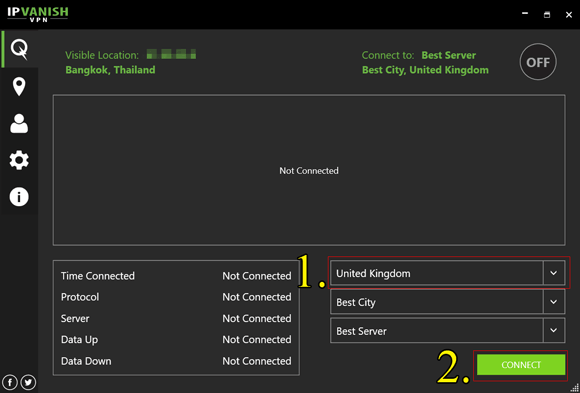 All you need to do is select a different location in the United Kingdom. For example, if you selected London on IPVanish and it didn’t work, you can try Liverpool, Manchester, Belfast or any of the other locations.